The day after arriving in Green River after traveling through Bryce Canyon National Park and Capitol Reef National Park I get an early start on what would be a long day. I took I-70 eastward into Grand County and followed the multiplexed US 191 south from the freeway towards Moab to Utah State Route 313. My start to the day was in Canyonlands National Park in the Island of the Sky District. 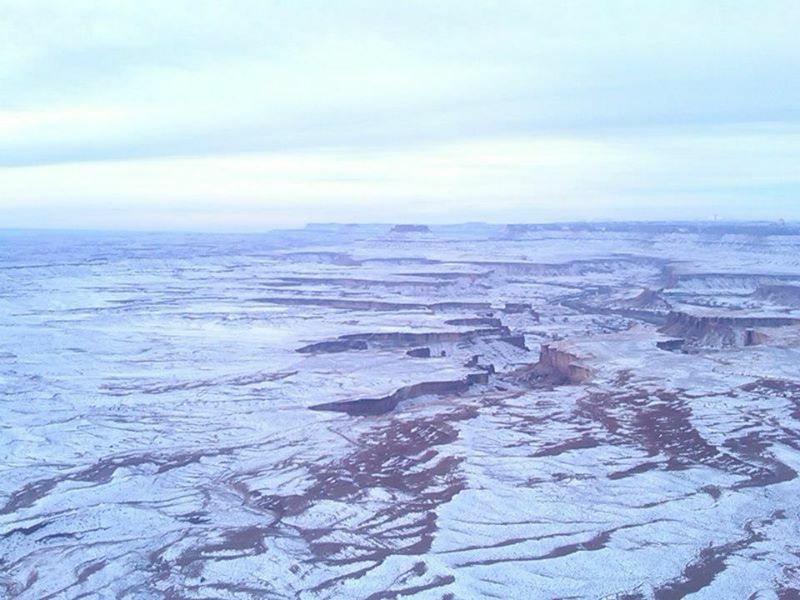 UT 313 connects to Grand View Point Road which is the main route through the Island of Sky District of Canyonlands National Park. From UT 313 I made my way south to the tip of the Island of the Sky on Grand View Point Road to Grand View Point for view during sunrise over the confluence of the Colorado River and Green River in addition to the La Sal Mountains. Canyonlands National Park is a relatively new National Park having been established in 1964. Unlike most National Parks the Canyonlands was not a National Monument nor carry any other designation of note. Canyonlands National Park consists of four districts; The Maze, The Rivers, The Needles, and the Island in the Sky. The Island in the Sky consists of land on the plateau between the Green River to the west and Colorado River to the east. From Grand View Point I gradually made my way up most of the overlooks and Grand View Point Road and did some minor hiking. Headed northward on Grand Point View Road I detoured west on on Upheaval Dome Road and Green River Overlook Road to the view point of the same name. 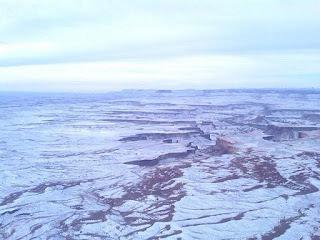 Over the years I've visited Canyonlands National Park several times. The most hazardous trip was in 2013 when I drove the Island of the Sky over a layer of compressed snow. Suffice to say the Green River Overlook appears much more differently with a thick layer of white snow. Probably the most underrated view is near the Island of the Sky Visitor Center high above Shafer Canyon Road. Shafer Canyon Road is an 18 mile four-wheel-drive road way connecting Grand View Road east to Utah State Route 279 near the Colorado River at the Intrepid Potash Mine. Shafer Canyon Road directly accesses the White Rim Road which traverses the perimeter of the Island of the Sky. Back in 2015 I traveled on UT 279 west from US 191 in Moab along the Colorado River. UT 279 is an approximately 15 mile State Highway which was intended to end at Dead Horse Point. UT 279 was legislatively approved in 1961 and opened in 1963 to the present terminus at Shafer Canyon Road. The second half of UT 279 to Dead Horse Point was never built and was deleted after UT 313 was approved on the existing county roadway to Dead Horse Point in 1975. The roadway along UT 279 is must see with the cliffs high above lining the Colorado River.